Question: I’ve read that Maryland and Vermont are “banning” felt soles this year, but I haven’t heard anything about what that actually means, in terms of where they’re banned and what the penalties are. Answer: Now that you mention it, there has been very little press about the mechanics of either ban. Maryland’s ban, which went into effect on March 22, was the first in the nation, and Vermont will follow suit on April 1. 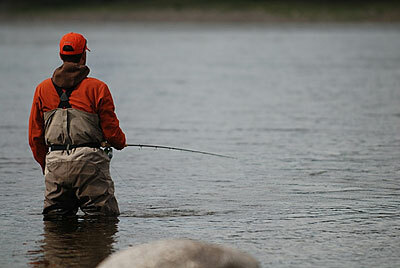 Opening day of the Vermont fishing season is the 9th. The Department will be using 2011 as an education year. The Department used public meetings and events, press releases, and news articles to get the word out beginning in March 2010. This education process will continue through this year. Natural Resource Police will be issuing warnings to violators and distributing information cards. The fine and penalties for wearing banned waders will be determined in consultation with the Sport and Tidal Fisheries Advisory Commissions’ Penalty Workgroup this summer and will be effective for 2012. Maximum penalties for all fisheries related violations are $1000 for a first offense and $2000 for a second offense. In Vermont, Fish & Wildlife enforcement officers won’t be so understanding. The first offense will cost you 5 points on your fishing license (that’s halfway to a 1-year suspension) and a $133 fine. You can buy a pair of studded rubber-sole boots for less than that, so it doesn’t make much sense to flout the new law. In both states, fisheries departments are stressing that just because you aren’t wearing felt doesn’t mean you shouldn’t inspect, clean, and dry your gear between fishing trips. Banning felt is just one step in the process of stopping the spread of aquatic nuisance species. My friend Matt Crawford at Pale Morning Media tells me that, to help sportsmen prepare for the new ban, the Vermont Fish & Wildlife Department is compiling a list of places where anglers and hunters can purchase the needed footwear to comply with the new law. Send via email to: [email protected]. The information will be posted on the Vermont Fish & Wildlife Website (www.vtfishandwildlife.com).